Netflix is obsessed with the end of the world. Since it got in the business of producing and distributing original movies a few years ago, the streaming platform has imagined a range of bleak science-fiction scenarios involving mass suicide (The Discovery), mass surveillance (Anon), mass invasion (The Cloverfield Paradox), and mass Sam Worthington turning into a weird alien fish-man (The Titan). Even on the comedy series front, one of the company's biggest word-of-mouth hits was called The End of the F***ing World. It's almost like they're trying to tell us something. Unfortunately, How It Ends, the latest feature to unceremoniously drop on the platform with scant promotion and even less hype, is trying to communicate very little. 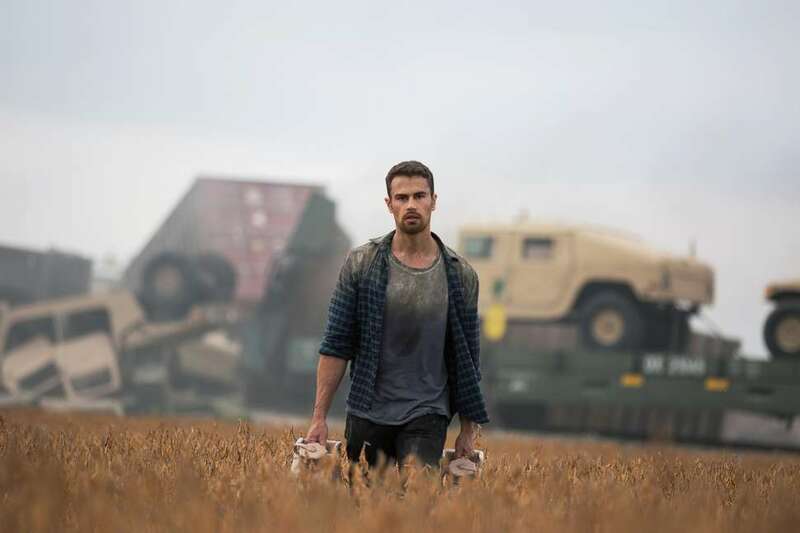 It's a loud and blustery thriller about a young lawyer named Will (Theo James from the Divergent series) who finds himself stranded in Chicago when a "seismic event" hits the West Coast and sends the country into a vague but familiar societal tailspin. There are reports on TV of a "large rumble" and fighter jets scramble in the sky. On a more personal level, Will's pregnant girlfriend Samantha (Kat Graham) is across the country in Seattle and he has no way of contacting her. The only way for Will to find her? Drive across the country with her gruff ex-military father Tom, played with extra crankiness by Oscar-winner Forest Whitaker. Tom has never had much use for Will -- he thinks he broke his boat on a family vacation years before -- but the two are stuck together, temporarily united by their love for Samantha. You can almost hear some executive saying, "It's Meet the Parents meets The Road," as the two load up their supplies in a car and prepare to see America. The problem is that How It Ends lacks both the wit of a father-in-law-bonding-with-his-son-in-law road-trip comedy and the raw terror of an ecological horror movie. It approaches the collapse of society with the zeal of a weary government employee checking items off a list. Working from a 2010 Black List script by writer Brooks McLaren, the story dutifully moves from set-piece to set-piece, mapping a path across Middle America that's short on insight. Instead, we get multiple scenes where characters have to shoot a handgun out a car window at menacing bad guys. Director David M. Rosenthal, who last helmed 2015's The Perfect Guy, struggles to find much tension or excitement in these bursts of violence, despite Whitaker doing his best take on the concerned (and deadly) father trope that Liam Neeson has perfected in recent years. This is the type of movie where a young woman looks at a cloud ominously, says, "Something's coming," then a big old bolt of lightning strikes the next second. At one point early in the journey, Will and Tom pass a sign that reads "Maximum Security Prison" and warns them not to pick up hitchhikers. OK, probably good advice. A moment later, a cop siren appears in their rearview mirror and the pair get pulled over on the side of road. Do you think the police officer might actually be an escaped prisoner? Maybe Will shouldn't get out of the car to go talk to this suspicious guy? Would you believe there's a very similar scene later in the movie involving a woman stranded in the middle of a road during a wildfire? Has Will never seen a Netflix thriller? There are feeble attempts to put the mysterious disaster in a larger socio-political context. We hear voices broadcast on ham radios asking if the Chinese or the North Koreans might be responsible for whatever happened out West. Earthquakes are reported, but later a character speculates that the entire event could be an act of war designed to "erase rational behavior with what appears to be a singular incident." The country is gripped with paranoia, terrified by the unknown, but it feels like cheap, knock-off hysteria. 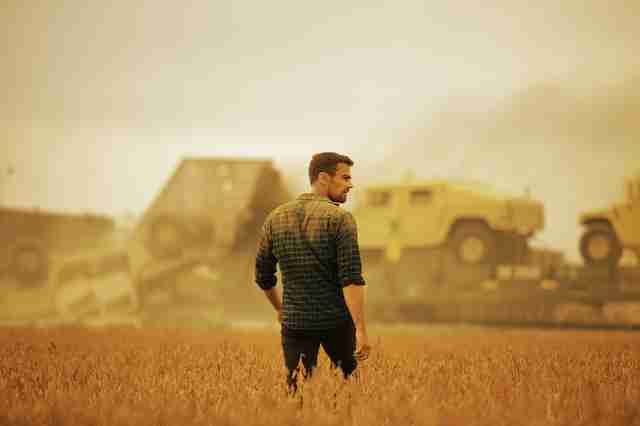 In the current media climate, a movie like How It Ends doesn't just have to compete with all the other post-apocalyptic products available on Netflix or Amazon. It also has to distract viewers from every conspiracy theorist delivering an unending monologue on YouTube, posting on Reddit, or weaving a web of feverish speculation on Twitter. Increasingly, everyone seems to have ideas about how it ends -- just look around. The more useful question is when. If How It Ends had a slightly more granular take on the end times, it might work. There's a flash of a more compelling movie when the characters stop by an abandoned water park covered in graffiti. A wry mechanic named Ricki (Grace Dove) who joins Will and Sam for a leg of their odyssey jumps into the water for a swim, but the water is too hot to enjoy. What happened to the water park? Did the owners just abandon it? Are there people living in the slides? It feels like the perfect set for a more intimate story, but How It Ends is too busy trying to see the whole country. It misses the beauty right in front of its face.